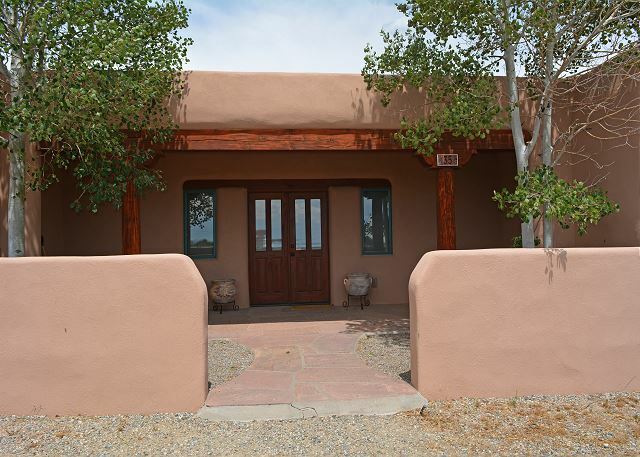 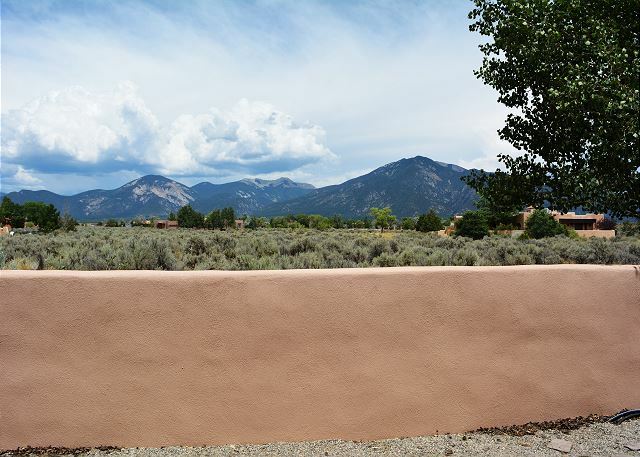 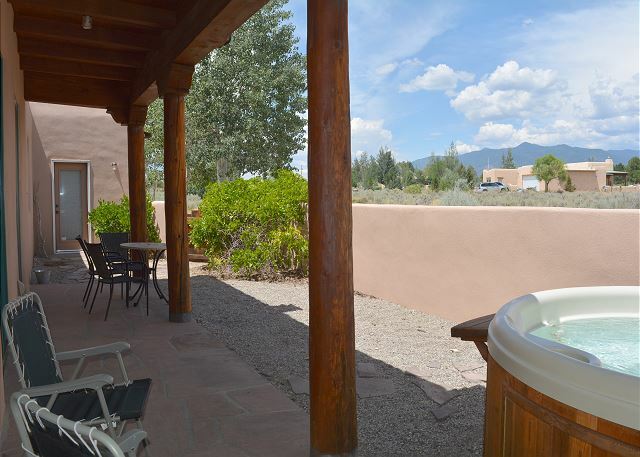 Casa Del Prado, located half way between everything in Taos, comes complete with majestic mountain views looking north, east and west! 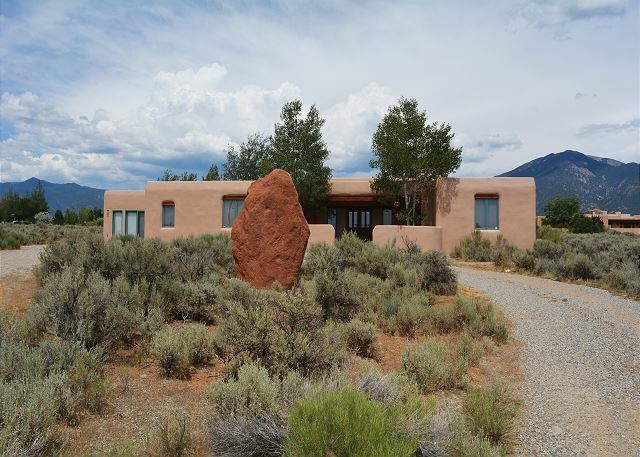 Casa Del Prado, located half way between everything in Taos, comes complete with majestic mountain views looking north, east and west! 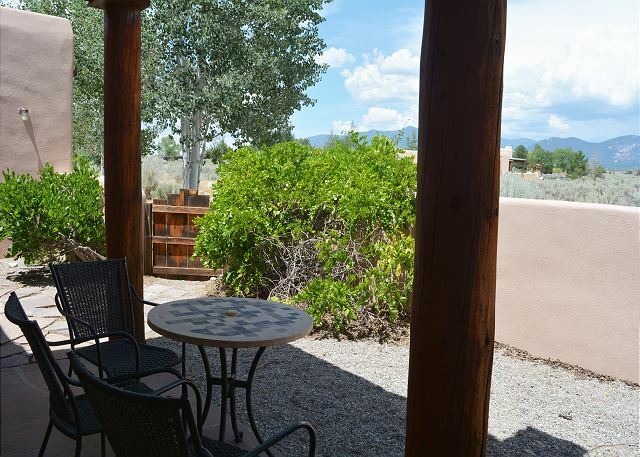 Have your morning coffee on the “Portal” (Spanish for covered walkway or patio) and watch the sun rise over Taos Mountain. Watch the famous Taos sun set every evening from the large front entry “portal”. 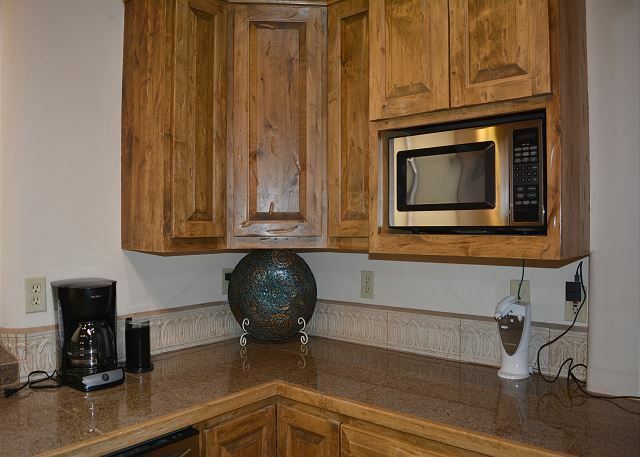 Or, simply stay indoors and watch either from the jumbo view windows. An open floor plan with large kitchen, dining and living room provides plenty of room for your group to gather. 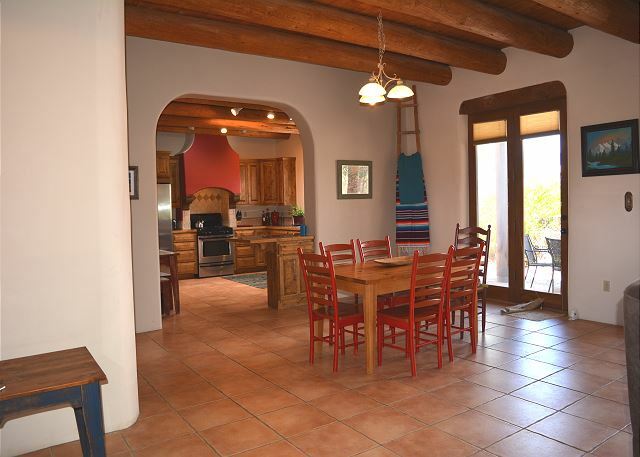 Avid cooks love the open well equipped kitchen and TV aficionados can still be a part of the group sharing’s and interactions in this spacious open great room. In addition, a jumbo “bonus room” comes complete with flat screen TV, 2 Queen size “American Leather” brand upscale luxury sleeper sofas. 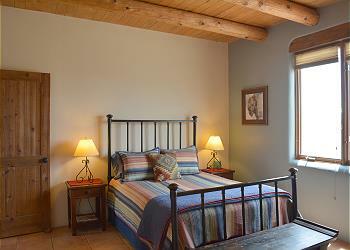 Guests report such things as, “Best night’s sleep I’ve ever had” and/or “Better than my luxury mattress at home”. This wonderful extra room can sleep 4 guests by night and during the day can become a bonus room / game room getaway. 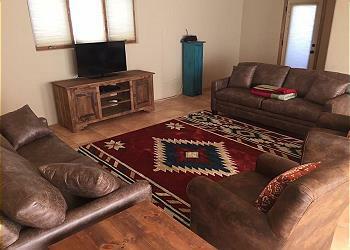 This all adds up to the Great room for adults and the Bonus room for the teens. 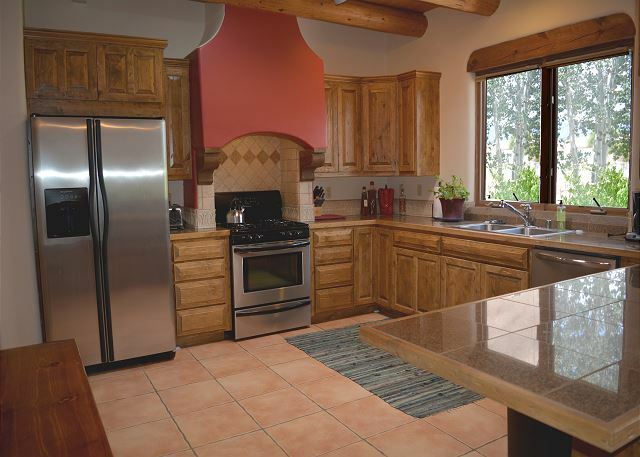 The large open “very southwest kitchen” with granite counters, solid wood cabinetry and upgrade stainless appliances is a dream come true for the avid chef in your group. 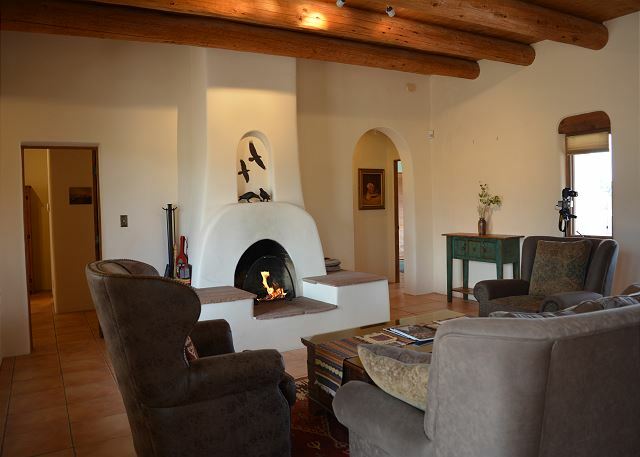 The kitchen along with the large dining area are open to expansive views of the living room and wood burning kiva fireplace. 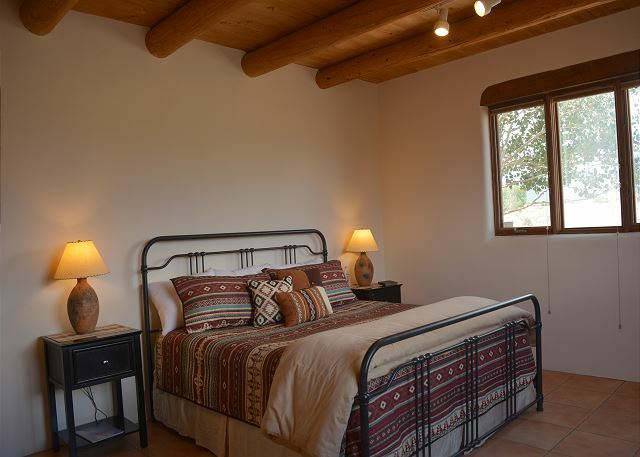 A master bedroom with King bed is singled out and alone for absolute quiet privacy on the north side of the house with expansive mountain views. 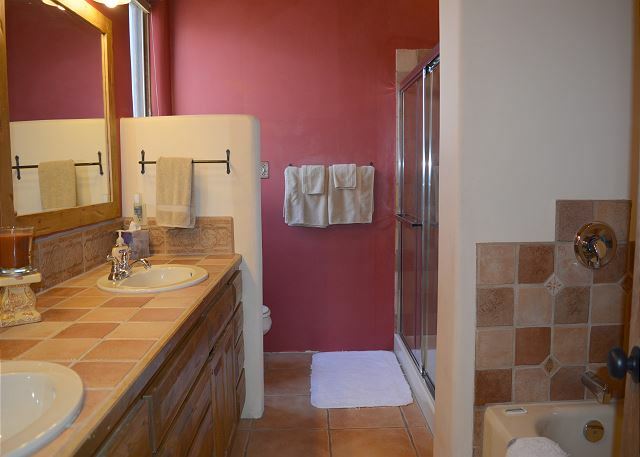 The master bath offers a walk in shower and separate tub. Located at the south end of the great room are two Queen guest bedrooms buffered from sound by their own 2 back to back bathrooms giving these two bedrooms quiet privacy. 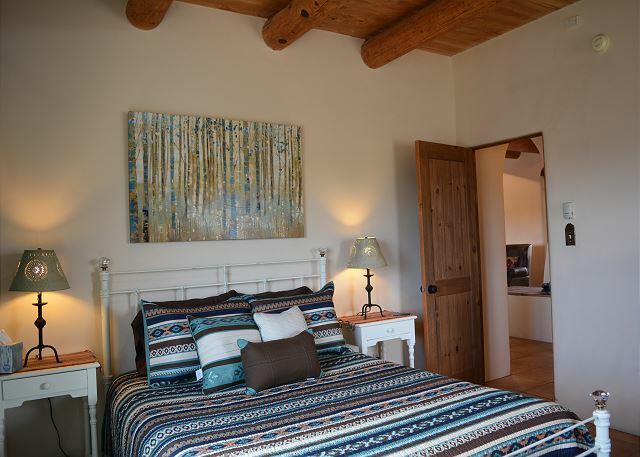 Guest bedroom #1 has its’ own in-suite bathroom with walk in shower. 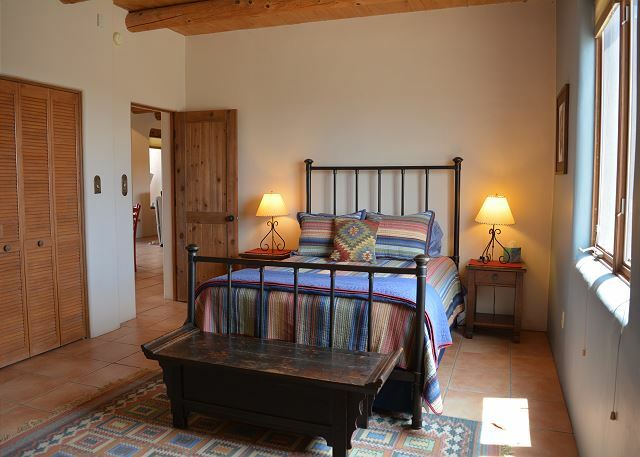 Guest bedroom #2 with an immediately adjacent 3rd bathroom is set off of a small alcove/hall and also has a walk in shower. 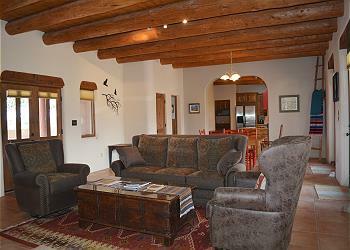 Then comes the large bonus room at the far north end with two luxury sleeper sofa’s and 2nd large screen TV. 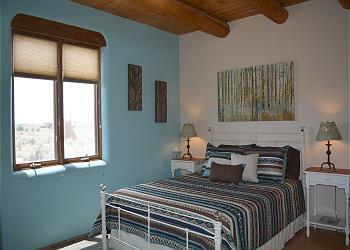 The room has many uses depending on the make up of the group. 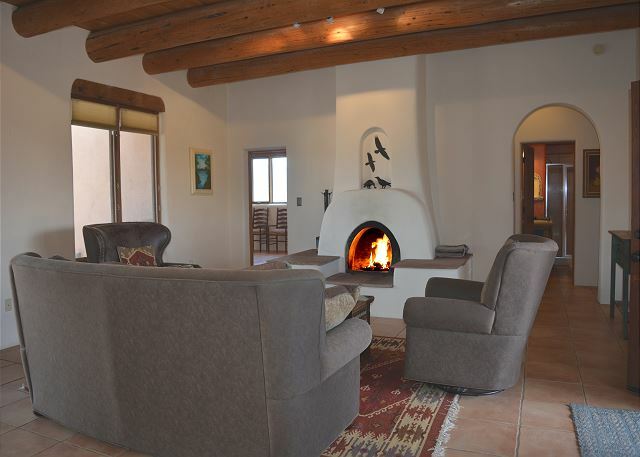 It works great for merging families with children and teens as well as for adult groups with sports minded enthusiasts and women who would rather gather and talk in the luxury living room with fireplace. 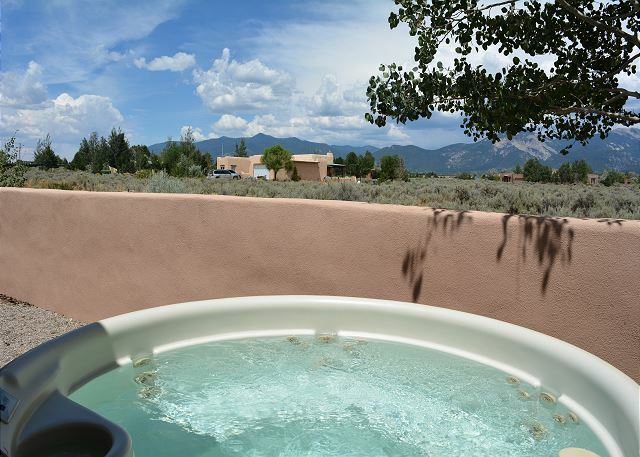 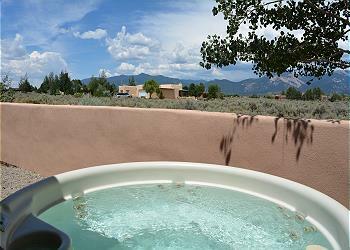 Outdoor living is enhanced by the existence of a hot tub for star gazing the famous “black” skies of Taos. The huge majority of folks have never known there were so many stars in the sky until they visited Taos and began star gazing. The lack of city lights is the reason and the cause of this popular mystery. 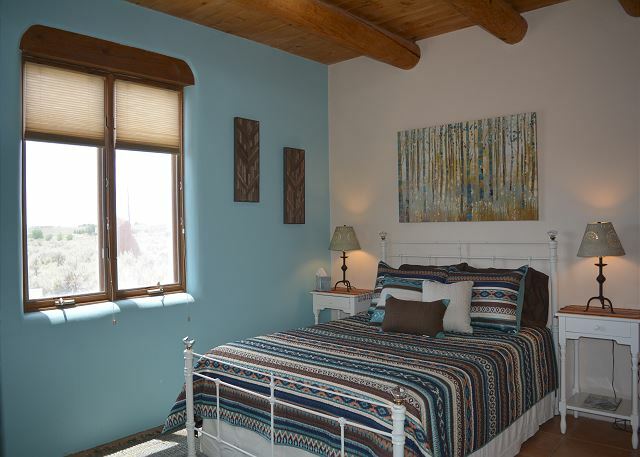 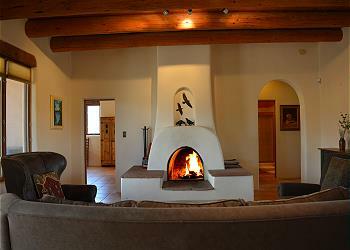 A stay at Casa del Prado is certain to send your group home refreshed and relaxed with warm fuzzy feelings of Taos, NM. 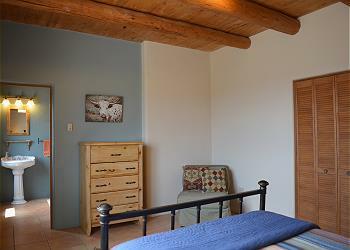 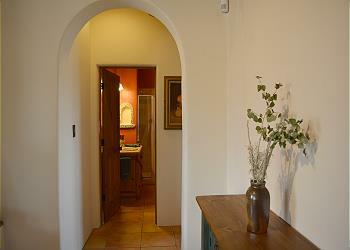 Room Description: Sleeps 6 in 3 bedrooms + 4 in Den. Master Bedroom 1 has King bed. 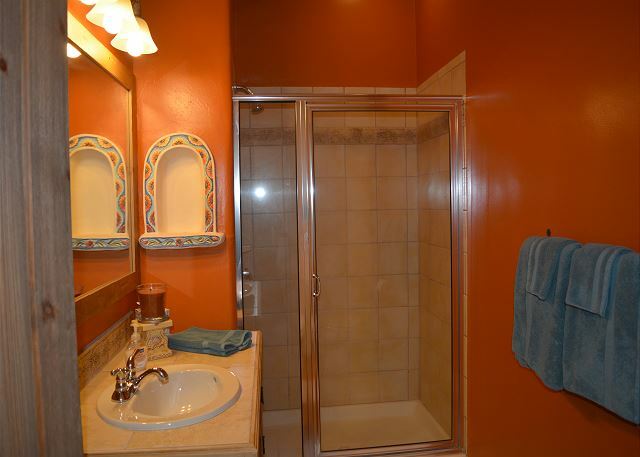 Master bath has Walk-in Shower and separate tub. Master 2 has Queen with walk-in shower. Guest bedroom 3 has queen with a shared bathroom walk in shower. 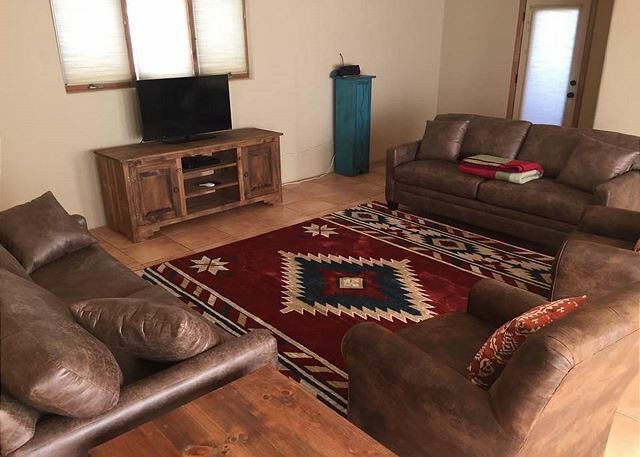 Den has 2 Queen sofa sleepers.